I have always been attracted to artwork with texture, I just love it when there's thick layers of paints or a rough surface. In my own work I've been playing around with textures on and off, in the beginning I used to create textured skies with paper mache and in past couple of months I have been doing a lot of experiments with a variety of textured mediums. These past few weeks my love of textures has become somewhat of an obsession. I did a round of all the local hardware stores to beg them for old wall paper books. Unfortunately that search came up empty so I've been scouring the local art supply stores for cool textured paper. I'm adding these awesome textures to my painting surface before adding the gesso and I am loving the effects of that in my final works! So far I've done some black and white pieces that have a very graphic feel to them, but I'm also working on a couple of pieces in color. I've mostly been combining the textures with direct transfers, but soon I will be adding this to some of my gel skin photo montages. I'm even thinking of combing it with the pouring medium I've been working with. This year has been all about experimenting in the studio and the time invested in definitely paint off. I feel like everything I've been working on is coming together now. I have a whole bunch of paintings that are wanting to be finished, I've even switched gears in some of them so I could incorporate the lovely pieces of paper that I've found. I'm super excited to move forward with this and I can't wait to see what will come out of my studio in a couple of weeks. So many paintings to finish... so little time... got to get back to work now... textures are waiting! It has been a busy week! Last minute Viva Vida Art Gallery was recruited to give a couple of art workshops for a big corporate event and they asked me to teach these workshops. We had three large groups of +20 people who came to try their hands at some direct transfers and create their own little Montréal souvenir to bring hom with them. It was an absolute blast to see how everyone created their own individual artwork despite all starting out with the same image. There's a lot of preparation that goes into events like this so we had our work cut out for us! But in the end we had everything under control and the workshops went smoothly, I think everyone had a great time! Tomorrow we will be starting another Acrylic Transfer class which will be a total of 6 Tuesday evening classes in which I am going to teach the acrylic gel skin process. If you are interested in taking part in this class please contact Viva Vida Art Gallery to apply. A couple of weeks back I talked about the difficulties of crossing the US border to do an Art Fair. Well I can report a tiny bit of progress on this front. I just spent the entire morning filling out forms to apply for a US visa. I have an appointment at the US Consulate tomorrow morning so I should be getting a definite Yes or No very, very soon! I'm keeping my fingers crossed that thew outcome will be positive, especially since you have to pay a substantial non refundable fee upfront so let's keep our fingers crossed! 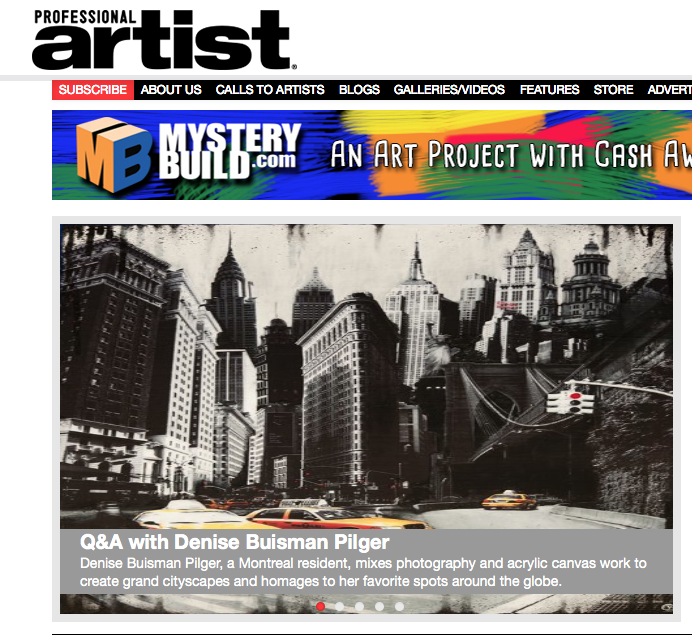 A couple of weeks ago I sat down with Professional Artist Magazine to talk about my work, you can read the resulting article here. I would like to take this opportunity to thank Professional Artist Magazine and journalist Adam Rhodes in particular, for this amazing opportunity! This past weekend were the Cultural Days in Montréal so that meant artsy celebrations at Viva Vida Art Gallery! We wee blessed with some beautiful fall weather which meant we could do our artist demonstrations outside! There was live music and loads of people came out to enjoy the activities. Next week we will start a new 6 week Acrylic transfer course at the gallery. In this course, that will take place on Tuesday evenings from 7-9:30 pm, I am going to teach how to create a painting using the gel skin transfer technique. There are still a few spaces left so if you are interested in taking this class with me please contact Viva Vida Art Gallery to reserve you spot!